Hybrid Karl Fischer Moisture Titrator MKH-700 has the world’s first & convenient functions equipped such as high-speed & high-precision measurement by “Hybrid titration method” which uses both “Volumetric titration method” and “Coulometric titration method”, and “Electrolytic Factor Measurement System” which does not require pure water for factor determination. 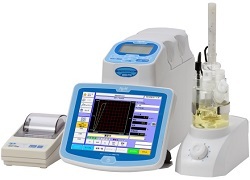 Karl Fischer Moisture Titrator which is on the market is necessary to adjust the sample amount when carrying out the measurement. “Hybrid titration method” automatically switches between the parallel measurement by “Volumetric titration method” and “Coulometric titration method” by monitoring moisture content in titration cell with high-speed & high-precision measurement, therefore can measure without adjusting the sample amount. With just pressing one button, the “Electrolytic Factor Measurement System” automatically performs the factor determination of Karl Fischer reagent, and save the time & work without using pure water. For more information, demo and technical support please contact our company N-Wissen GmbH on +49 (0) 69 8900 4008 or at info@n-wissen.de.